the 1928 edition published by the New York Consolidated Card Co., Long Island City, N.Y. It depicts an advertisement for No. 53 Gem Playing Cards, available in either a tuck box or a 2-pack box, with either an Angel Back or Back No. 86. The two pack box included one red deck and one blue deck. No. 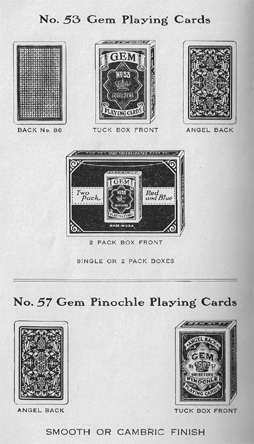 57 Gem Pinochle Playing Cards were also available, with an Angel Back in a Tuck Box.